Top Ten Ways to Get Color in the Garden Without Flowers | Faddegon's Nursery, Inc.
Let’s face it. Flowers are beautiful but they are work. Living things are like that. Most flowering perennials need nutrients, water, and some loving kindness to thrive. And their neediness doesn’t stop after blooming. They still need to be deadheaded, tidied-up and watered. Harumph! Wouldn’t it be nice to have color in the garden with minimal involvement on our part? Below are ten ideas to add pizzazz but let me start by saying mulch is not one of them. I know I risk offending some folks, but I believe mulch should be understated (i.e., not orange), a functional backdrop to plants and not the focal point. There, I said it! Leave it to the leaves. Admit it or not, leaves are the backbone of your perennial gardens. They play an invaluable, and usually thankless, role. When interviewed by a national gardening magazine about how I design beautiful, three season gardens, I gave foliage much of the credit. Great leaves can complement flowers and bring out their best, just like a beautiful bouquet. Leaves can also hide eyesores and carry the interest when there are no blooms in sight. When designing gardens, I count on at least one out of three perennials to contribute striking leaves. And leaves are little or no work. Some great perennial families with sassy leaves include coral bell (Heuchera), deadnettle (Lamium), Ligularia, Hosta, foamflower (Tiarella), ornamental grasses, lungwort (Pulmonaria), Sedum and snakeroot (Cimicifuga). Colorful containers and urns help breakup ‘boring’ expanses of flowers. You don’t even have to fill them with flowers. Besides, planting them only defeats the purpose of reducing maintenance time. Tuck interesting pieces among perennials and shrubs or set them by themselves as focal points. I am a huge fan of glazed blue containers, especially in the shade where blue flowering perennials are a rare find. Chairs and benches add pop. 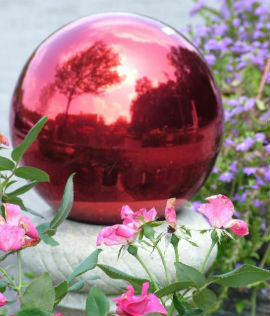 Gazing globes, birdhouses, birdbaths and other entertaining pieces are always fun. Let your personality shine. Glowing globes are becoming the rage. They contain a special material that absorbs sunlight, turning them into solar-powered beacons at night. You can also buy glowing gnomes and fairies. I tend to be on the conservative side and stick with gazing globes. I tuck blue gazing globes of varied dimensions (4”, 6” and 10” diameter) throughout my gardens. Some are placed on the ground, nestled among cool foliaged plants while others sit atop stands or in birdbath basins. These ornaments subtly carry the eye from one garden bed to the next with no handholding on my part. Statuary and fountains are a no-brainer. My favorite. The added bonus of fountains is the soothing sound of running water they provide. My only comment on statuary and fountains is to be careful they are in scale to the surrounding area. If they are too large or tiny for the space, they look silly. Outdoor lighting can be a unique color source. Agreed, we are talking primarily in the evening but this is when many of us actually have time to enjoy our gardens. When locating the lamps, think creatively. Don’t just blast an area with ‘stadium lights’. Outdoor lighting is an art form and there are landscape specialists in this area. Uplighting, down lighting and backlighting create magical atmosphere. Don’t just think ‘white’ light. Use different colored bulbs to make a light show second to none. And by using LED powered ‘projectors’, you also will save money. You can direct lighting to focal points, pathways, walls, water features, gracefully branched trees and through special light panels in decking. Stonework (natural stone or man-made tiles) and stamped colored concrete are solid choices. Concrete acid stains have now evolved from earthy color selections to greens, blues and lavender. Obelisks, armillaries and sundials add a ‘cottagey’ dimension. I like planting delicate, wispy flowers or foliage around their base that act as ballerina skirts. Theme ‘panels’ that are placed on walls or freestanding can also add punch. Usually these are in sections or they come as folding panels with colorful artwork painted on them. Spray paint can be likened to duct tape. Very functional. I spray spent flower heads of alliums, astilbes and hydrangeas to extend color into the fall (and winter if I don’t whack the plants back). You can spray just about anything to add excitement. Heck, one of my students even spray-painted the tail of a friendly gray squirrel in his yard bright blue. Is nothing sacred? Are you starting to think outside the box when it comes to adding color to the garden? Who needs flowers? Well, okay, if they are silk.